Tattoos are a popular form of body art that have been in practice for many years. It is done by inserting ink into the upper layer of the skin, making a permanent mark that stays on for a lifetime. Tattoos are used throughout the world but their importance and significance vary with culture, religion and location. In the Western world, tattoos were considered to be a form of body art for bikers, sailors and gangsters. But today, tattoos have become popular with everyone, irrespective of culture, age and gender. The meaning and significance of a tattoo highly depends on the placement of it on the body. Arms, shoulders, feet, wrist and back are some of the common body areas where tattoos are done. Men prefer large tattoos that will make them look masculine while women love delicate and feminine designs. Massive and elaborately done arm tattoos for men are very popular and they will make them look very powerful and strong. The following post has 32 arm tattoo designs exclusively designed for men. Each design is elaborately done with intricate details and carries a special and unique meaning to the bearer. Fill your life with luck and charm with this colorful and classy Chinese tattoo on the upper arm. Swim peacefully through the tough times in life with this colorful and intricately designed fish tattoo on the arm. Lovely ship tattoo on the arm will make your life fun-filled and adventurous. Make a bold and daring statement about life with this simple yet interesting tattoo on the arm. Bold black tribal tattoo on the arm will make you strong and powerful. This elaborate arm tattoo holds lots of deep meanings hidden within it. The intricate details and shading make it very attractive. Exquisitely done fire spurting dragon tattoo is striking with sophisticated details and colors. Intricate designs and exquisite shading make this tattoo very interesting and attractive. This stylish tattoo with black shading is a real piece of art. The exceptional shading gives a three-dimensional effect. Fierce jaws tattoo with elaborate details and shading will make you stand out from the rest. This fierce-looking Viking tattoo is sure to bring fear to the onlookers. The exquisite background shading makes it captivating. Interestingly designed demon tattoo on the upper arm shows your strong and powerful nature. Exquisitely inked traditional Balinese tattoo of a lion-like creature will keep all the evil spirits at bay. Show your strong nature with this elaborate skull tattoo intricately inked on the upper arm. Let this colorful and attractive Chinese dragon tattoo bring good luck and fortune to you. Lovely details with colorful accents make this an interesting and attractive piece of body art. This special tattoo of a guardian angel slaying the devil, will make heads turn in fascination. Make a bold and daring change to your personality with this ferocious face tattoo on the arm. Spread the message of peace and freedom with this exquisite tattoo of the Roman goddess of freedom. Beautifully designed Greek goddess tattoo looks fascinating with intricate details and wonderful shading. Peace, love and serenity will always be your way with this lovely Buddha tattoo on your arm. Make people gasp in fascination with this exquisitely designed arm tattoo. The sophisticated shading makes it very appealing. Beautiful phoenix tattoo looks stunning with lovely details and shading. This colorful and funny looking skeleton tattoo is interesting with cute details. 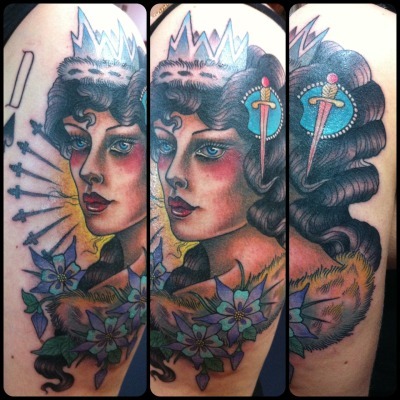 Beautiful face of a queen on the arm looks very appealing with perfect details and colorful shading. Fascinating and interesting, this exquisite tattoo on the arm is a work of a true genius. The elaborate details and sophisticated shading make it outstanding. This cool tattoo on the arm looks interesting with colorful details. Attractive snake tattoo on the arm with elaborate details and shading looks stunning on a bold black background. Beautiful tribal tattoo on the arm looks amazing with lovely details and shading. Simple yet interesting, this arm tattoo carries a deep meaning to the bearer. Colorful clover leaf in an intricately designed frame signifies a symbolic and special meaning. Your powerful and daring character will be complete with this attractive tiger tattoo on the arm.